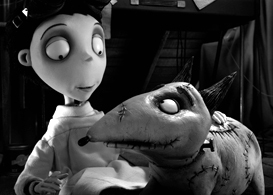 Fans of Tim Burton’s original 1984 live action short Frankenweenie will not be disappointed. This stop-motion animated feature mirrors the plot of the original, but screenwriter John August has added plenty of excitement and quirky characters to make for a thoroughly moving adaptation. In addition to being 3D and animated, the film has the unique style of being black-and-white. Danny Elfman has composed a moving orchestral score with his trademark strings and background choirs reminiscent of Edward Scissorhands. Most importantly, this is a story that Tim Burton crafted nearly three decades ago, before Batman and Beetlejuice put him on the map as cinema’s maestro of the dark and twisted. Frankenweenie shines with the same characteristic style of his previous masterworks and may even be Tim Burton’s best film since Big Fish. The story follows young Victor Frankenstein, a boy with no friends and a natural proclivity towards science, not to mention an uncanny resemblance to Mr. Burton. He loves his dog Sparky more than anything. But when Sparky dies unexpectedly, Victor takes his science fair project to the next level and successfully resurrects Sparky’s corpse from the dead. Despite Victor’s attempts at keeping his post mortem resuscitation a secret, the curious dog escapes and is seen by Edgar “E” Gore, a hunchbacked classmate who blackmails Victor into teaching him how to bring the dead back to life. Soon enough, animals are being resurrected that would have been better off just staying dead, and it’s up to Victor to save the town from being destroyed. They say lightning strikes the Dutch settlement of New Holland every night, and the characters that Victor encounters throughout his journey all seem like they’ve been struck at least a few times. Burton has a natural ability to amplify the idiosyncrasies of his characters, and New Holland is the perfect setting for his imagination to run wild. Disney should be commended for taking a risk with a movie of this style and subject matter. However, if the movie proves to be a hit, it could very well lead to a theme park ride, toy line, and sequel. I can see the wide-eyed Mr. Whiskers or Sparky doll with detachable limbs lining toy store shelves in the not so distant future. Frankenweenie is a film exploring the power of a young boy’s love for his dog despite the hurdles that life (or the absence thereof) throws in his way. While parents may question whether their kids should see a movie about bringing a pet back to life, they should embrace the opportunity to open the dialogue about life and death with their children. And at the very least, they’ll enjoy a touching film about a powerful relationship that everyone can relate to: the bond between a boy and his dog. Frankenweenie opens this Friday October 5th nationwide. Watch the trailer.